I've been involved in a lot of different musical endeavors over the years. Some of those projects became fond memories and others became valuable lessons, but all in all I've enjoyed myself and accumulated some rather amusing stories. Today, I'll share one of those stories with you in the hopes that you are entertained. There's no profound lesson or advice here, so just enjoy this glimpse into the past. I only had one real friend growing up and it's entirely his fault that I became obsessed with the power and fury of Heavy Metal and later let music take almost complete control of my life. Music has led me to a life of meager income, funny looks from the general public and some of the best times I could have possibly imagined. Come to think of it, I probably haven't thanked him enough for that, but maybe I will someday. Even though you could hardly call it a band, we started recording demos in a cramped, sweltering laundry room with a keyboard for a drummer. Most of these demos are long gone and frankly aren't worth listening to for more than a laugh, but there was one song that always stuck out as a shining beacon of pure potential and neither one of us forgot about it. Both of us had come a long way from our blatant-Metallica-rip-off days in the laundry room when we decided to give recording together another try. He had just moved into a new place with a spacious, albeit slightly decrepit garage and we had both immersed ourselves in the sound of Black Metal. The lo-fi production, tortured screams and furious speed of the genre spoke out to us from a very dark and twisted place that seemed all too familiar. I began to embrace being an outcast and in my mind, became a black-clad spectre that roamed my small town terrorizing suburbanites with nothing more than a glance. All this while a soundtrack of noisy guitar riffs and incessant blastbeats whirled around my head. When the idea to rekindle our previous collaboration in the form of a misanthropic, booze-soaked maelstrom of noise and anger first came about, I was immediately on board. We had everything we thought we needed to make decent Black Metal: instruments, seething hatred for the world around us, a place to play really loud and a severe lack of decent recording equipment. As with most musicians, especially Heavy Metal fans, we decorated our rehearsal space/lair with images that resonated with us and brought inspiration. For some people, this would mean posters of iconic musicians and maybe a neon sign of their favorite beer or perhaps a bit of adult-themed eye candy. For us however, this meant lots of spray-painted Satanic imagery. 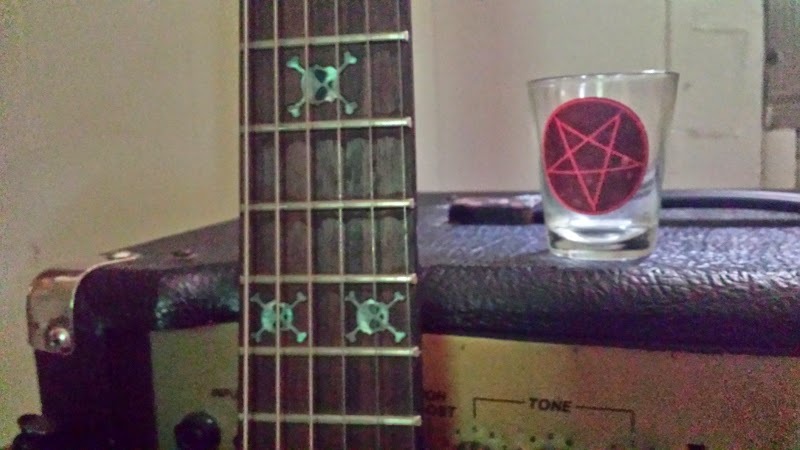 All the standard stuff, three sixes, inverted crosses and pentagrams and even a broken snare drum with a detailed Sigil of Baphomet drawn in permanent marker. Neither of us were Satanists, but let's just say that, in one way or another, we both had experienced the ugly side of frequent church-goers at some point in our lives. In fact, I'm pretty sure it's called the “bible belt” because if you don't do what they say, they'll whip you with it. We saw the Satanic imagery of Black Metal as a way to let the world know “we know you don't like us and that's fine because we don't like you either”. On a personal level, anything that got people to leave me alone was something that I was all for and I embraced it on that basis. At the time, both of us felt stuck in our respective situations and that there wasn't much hope for the future. Looking back, one could possibly make the case that we were both on the brink of complete mental breakdown, but we survived and came out of it stronger people. For as much misguided anger as we had, people are lucky all we did was play sloppy Black Metal late at night. That creepy, increasingly disgusting garage became our refuge from the world. We would get in there and play until the room was too hot, smoky and spun too fast to bear any longer. Then we'd go on about our lives until we could do it again the following weekend. We never recorded very much and the band never went anywhere, but that didn't matter because catharsis was really what we pursued. That catharsis manifested itself one night into a stocky, young cop who had no idea what he was about to walk into. As I'm sure you're aware, in a small town with little-to-no actual crime, noise is a major issue. Never mind the fact that the guy across the street from us would blare Firehouse and Bon Jovi at all hours of the night with his windows open or the fact that we were using small practice amps. If we played just one second past 10 pm, the police were called; we must have really sounded disturbing. I imagine that cop parking his cruiser with a smug grin, thinking “I'm gonna put the fear of God into these kids” as he strolled up to our home away from home. He threw open what passed for a door with righteous indignation and immediately recoiled in horror at the sight he beheld. The soundproofing we added to the back wall had been decorated with a rather elaborate pentagram reminiscent of the one in the middle of the Morbid Angel logo and his eyes darted back and forth between that and our faces, but mostly remained fixed upon the artwork. He noticed the beer bottles strewn about and asked for our identification in a shaky voice, but since neither of us had any intention of driving that night, we left our wallets inside the house. “J-just gimme your birthdays then” he said, scanning what he surely perceived as a dungeon of ritualistic evil, completely overlooking certain items that were of “questionable legality” to say the least. We quickly rattled off our birthdays and he gave us a rather unconvincing warning that if he had to come back, it would result in a one thousand dollar fine. When he said, “Just keep it down, I don't want to have to come back”, it dripped with sincerity as he backed out of the garage. Once he left, we laughed as hard as we had in a long time and continued to do so when we imagined him chatting with his cop buddies later about stumbling into a den of “pure evil”. “Guys, I'm telling you, it was even written on the walls!” we joked as we finished our beers and cleaned up a bit, looking around at imagery that we suddenly viewed as having saved us from who knows what. I can't say for certain, but I think that night may have been a turning point in our lives, or at least mine. The harsh sounds became less of an outlet for rage and more of a sanctuary; a happy place, oddly enough. I had no idea of the amount of power that Heavy Metal's sometimes demonic imagery held over some people. Being called a “devil worshiper” in elementary school must have planted the idea deep in the back of my head that I can use someone's preconceived notions about me to my advantage. Even though that wasn't our intention, it's exactly what happened that night in the garage. Even though those days were littered with bad decisions and even worse people, I remember them fondly. I've come to realize that all those things, good and bad, have made my life the special and unique experience that it is and has truly helped me grow. Somehow, I always knew this music would save me.